Oh ABC Cocina, how long I had to wait to visit... Once I realized I would be in town for labor day weekend, I looked up reservations for ABC Cocina and snagged one for Friday lunch. (Holiday weekends in NYC are the BEST time to snag hard-to-get restaurant reservations, as there is often a mass exodus from the City). I was so excited, I re-read the menu and some reviews the day before. Sadly enough, half of the items I was prepared to order were no longer in season! The website hadn't updated to reflect the new menu yet. Just FYI the sweet pea guacamole that people rave about is no longer offered, as peas were a summer thing. Anyway, lunch was still as wonderful as I expected it to be (Jean-Georges almost never disappoints), and I loved the dining room and ambience. Soaring ceilings, textured walls, and random chandeliers. 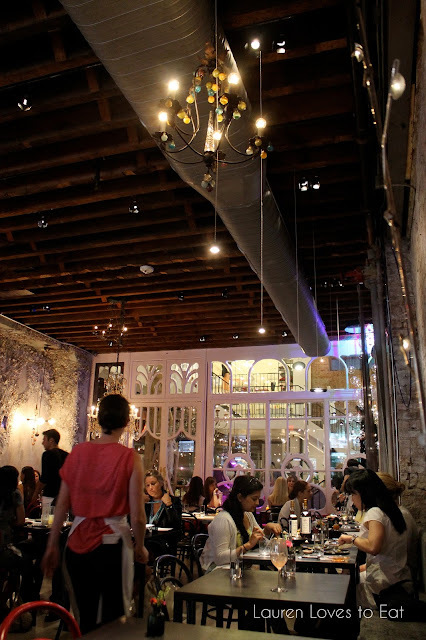 The doors at the back of the restaurant lead to ABC Kitchen and also ABC Carpet and Home. (Beautiful store to check out when you're done eating). All the dishes, furniture, and lighting fixtures are from ABC Carpet and Home, and can be purchased! Baby calamari stuffed with chorizo, tomato salad and chickpeas, $14: Great starter-- beautifully tender calamari, slightly spicy sausage, and the freshest tomatoes. Peekytoe crab and corn fritters, chipotle mayo, $12: I like crab and I like corn, but for some reason I wasn't blown away at all by this combination. Could've skipped this order. 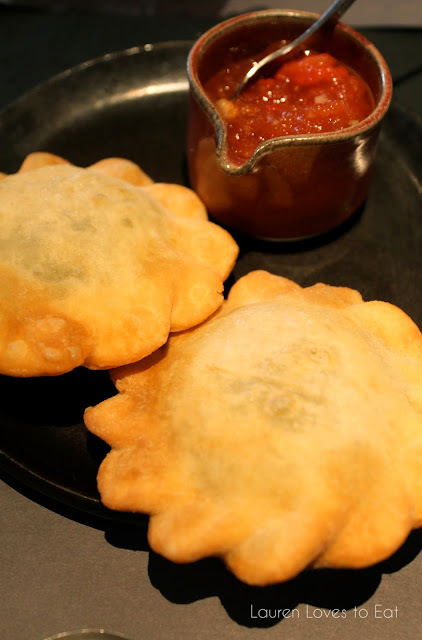 Field green empanadas and tomato jam, $8: The "green" in these empanadas was a mix of seasonal vegetables. 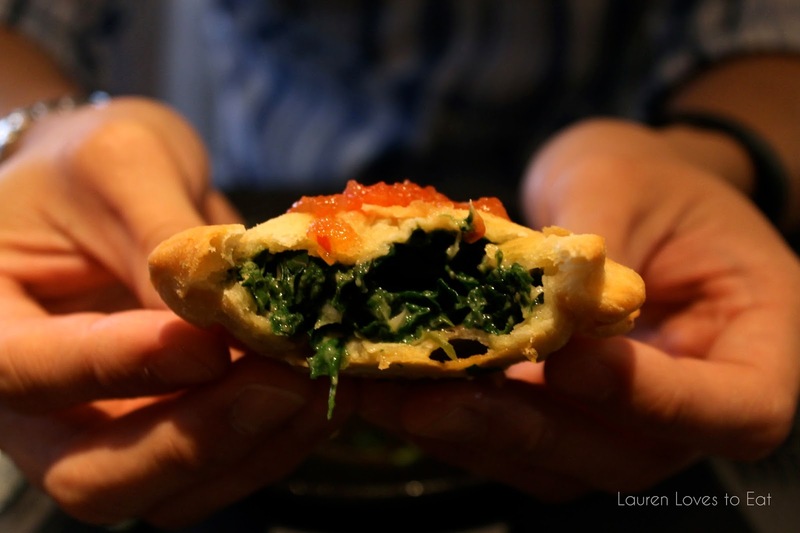 This tasted a lot like spinach artichoke dip, but with fresher vegetables and an incredible flaky pastry crust. The sweet and savory tomato jam was amazing. Loved this dish. 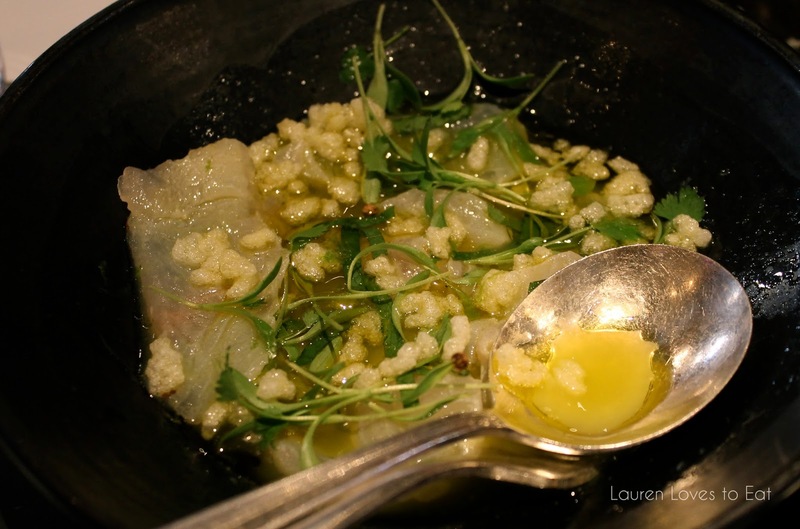 Raw shaved fluke with green chili dressing, crunchy rice and herbs, $13: My bf is crazy about ceviche, so he had to order this. I thought it was decent, but honestly all of these types of dishes taste similar to me-- the citrusy dressing, herbs, and white fish. 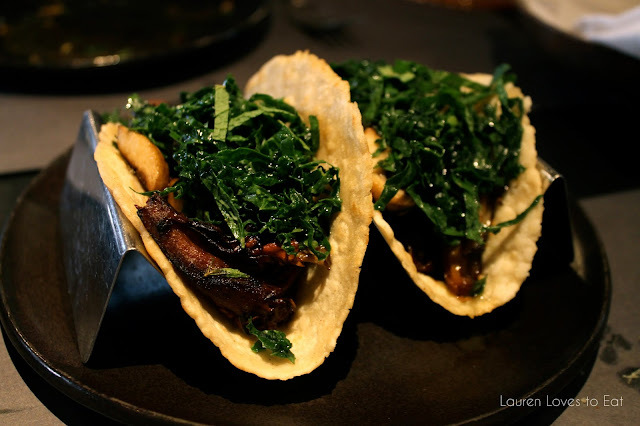 Sautéed mushroom tacos, mole, kale and lime, $11: Now THIS is something to write home about. The first time I'd ever seen mushroom in tacos on a menu, let alone kale in tacos. The combination? Genius. 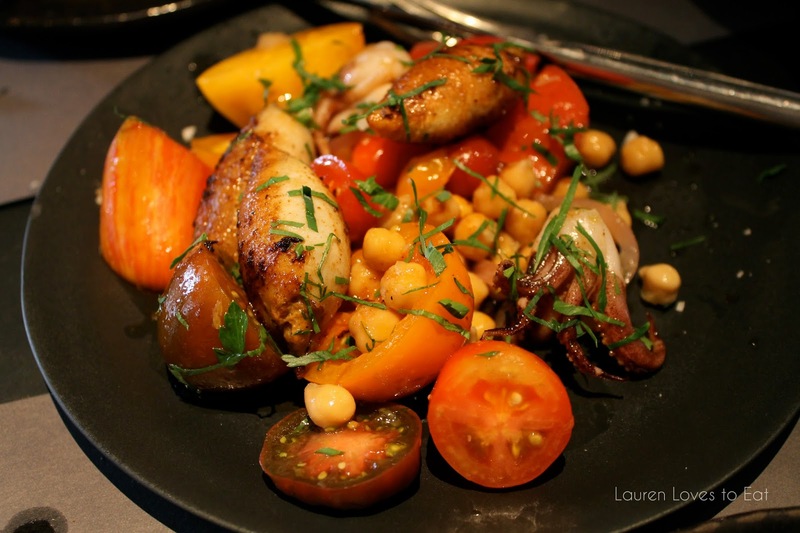 The mushrooms were sautéed to the perfect degree of flavorful, juicy, and ultra tender. The lime juices did wonders for bringing out the kale, and the tacos were hot, soft, and the right thickness to keep all the mushroom juice from seeping through. omg this was so good. 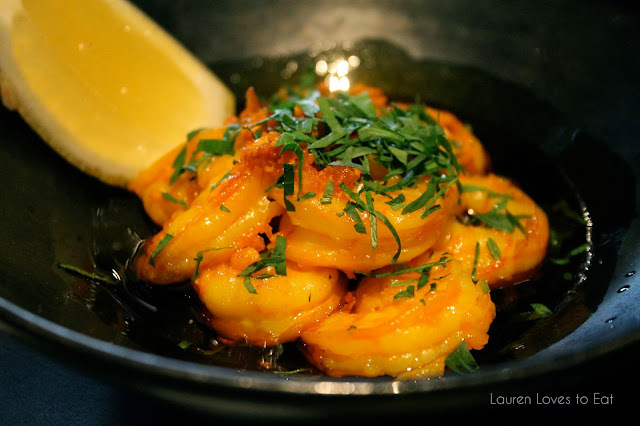 Shrimp with sizzling garlic and chili oil, $14: We couldn't decide if we were full or not, so since we like to make sure to always satiate our fatty selves, we ordered this shrimp. It's hard to go wrong with shrimp bathed in garlic and chili oil, and this was definitely tasty. I was happy to find little garlic chips swimming in the oil. A tasty dish, but nothing too spectacular or earth shattering. Caramelized white chocolate rice pudding with raspberry compote, $9: I love rice pudding (Rice to Riches, anyone? ), so when I saw it on the menu, I knew it was a must. 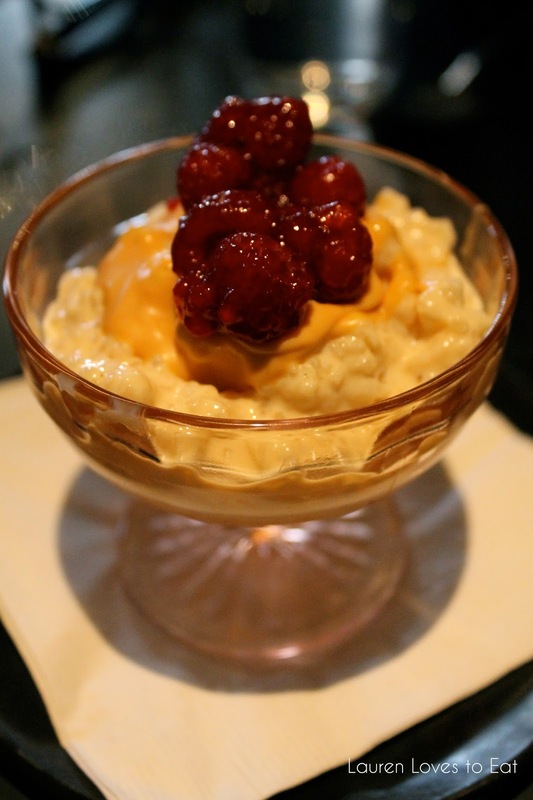 This was insanely good, with hardened white chocolate between the raspberries and rice pudding, bringing a nice sweetness while being balanced out by the tart fruit. One of the best desserts I've had in a long time. 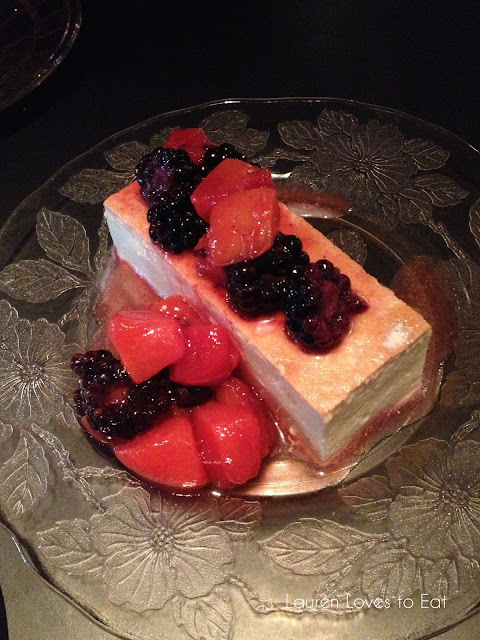 Cream cheese tres leches cake with peach blackberry compote, $9: When unable to decide between two desserts, get both! I liked that this dessert wasn't too sweet. For being "three milks", it wasn't too creamy either. It was thick and dense, with mild flavors and some more deliciously seasonal fruit. Completely worth waiting months to get a reservation for. 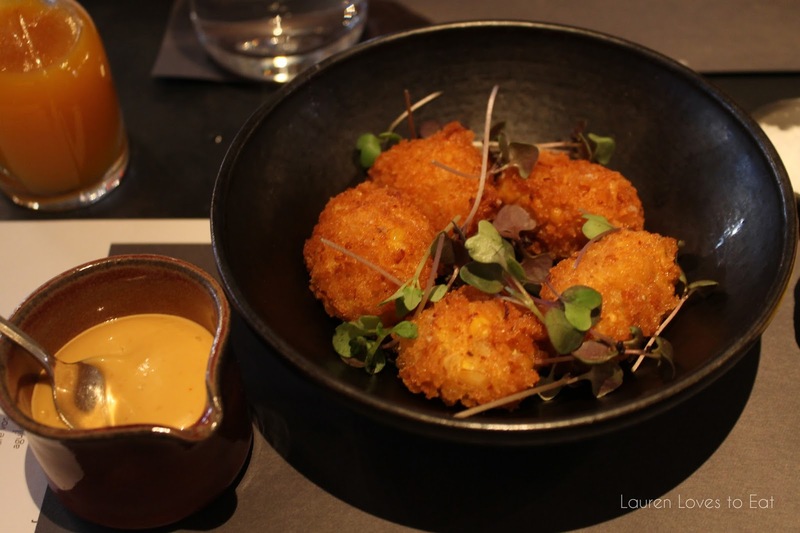 I feel like I need to thank Jean-Georges for introducing me to some pretty memorable food-- mushroom egg pizza at ABC Kitchen, the best fried chicken ever at Perry Street, amazing parmesan-crusted chicken at Jean-Georges, and now mushroom tacos at ABC Cocina. Thank you. *Reservations are often booked a month in advance, but call the restaurant, because any time there are last-minute cancellations, chances are you'll get the table via phone versus through OpenTable. this place looks fantastic lauren, it's been on my list but it's impossible to get resv.